Enjoy coming home to this lovely Oasis! Uniquely situated along the Kiowa creek, 3miles S. of I-70and 6miles N. of Quincy. Enjoy the quiet country lifestyle with the convenience of a big city less than 30min away. Lots of beautiful mature trees, all season pond with waterfall, firepit, mountain and creek views all year long. NO Covenants or HOA fees!!! Work from home if you'd like, newly installed fiber optics. 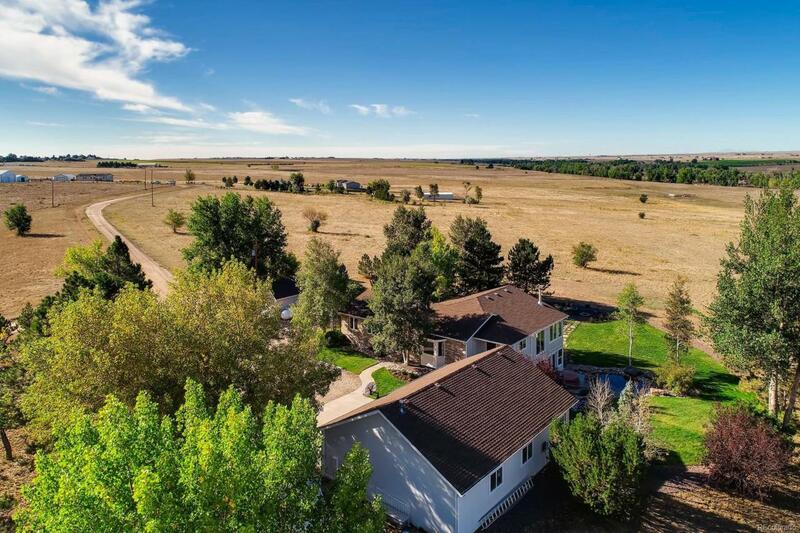 This is one spectacular property and tastefully updated from top to bottom.Main Master Floor bedroom with newly updated bathroom and main floor laundry and mud room. Enjoy some weekend fun with family and friends entertaining in your finished basement hosting a football party complimented by your mini bar kitchenette. Room for the big screen TV and seating. Be sure to check out the amazing fitness room overlooking the pond. This is a must see! Pictures don't capture all of its true beauty and what the land has to offer! Don't miss your opportunity!